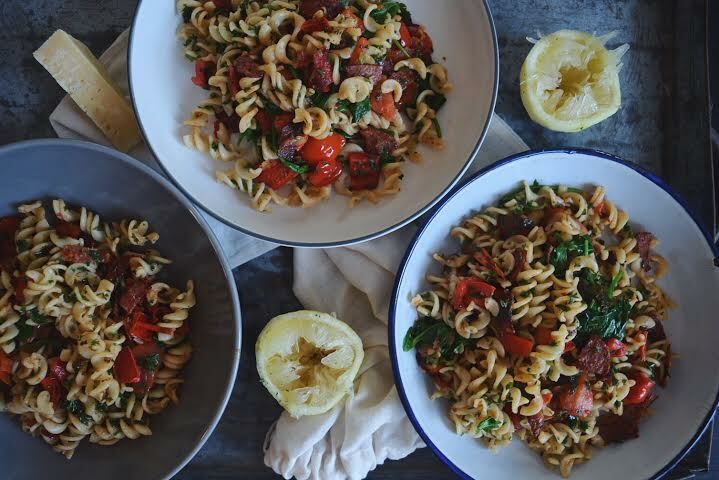 If you’re looking for a quick and easy mid-week recipe then this pasta dish might just be this might be the one for you! It’s so easy, I have even been able to teach my boyfriend to whip this one up when it’s his turn to cook dinner and he isn’t doing his specialty (roast lamb, another favourite of mine!). It’s also a good one to pass onto family or friends who might be worried about what to cook for you if they are having you for over dinner. It’s even delicious done with gluten free pasta! Fill a large pot with water and place on the heat to boil in preparation for cooking your pasta. Once boiling, add the pasta and cook according to the instructions. Drain well. In a large saucepan, heat 1 tbsp of olive oil and fry the salami on a medium heat until it starts to become crispy. Once your salami starts to crisp, add the capsicum and fry both together for a further 3 minutes until the capsicum just starts to lose some of its crunch. Add the chilli flakes and tomato and continue to fry until the tomato just starts to soften. At this point add the lemon zest and juice. The juice should help to lift all the extra flavours from the pan. Add to the pan the cook and drained pasta, parsley and rocket and gently toss through until well combined. Check seasoning and add salt and pepper if required. Serve topped with freshly shaved parmesan. Personally I like to ensure I have all my ingredients prepared before I start cooking my pasta, that way I can start frying all my ingredients while my pasta is cooking making this dish easy to prepare in around 15 minutes! Recipe created by the talented "The Fructose Friendly Chef" Melissa! Check out her work and what she is all about.